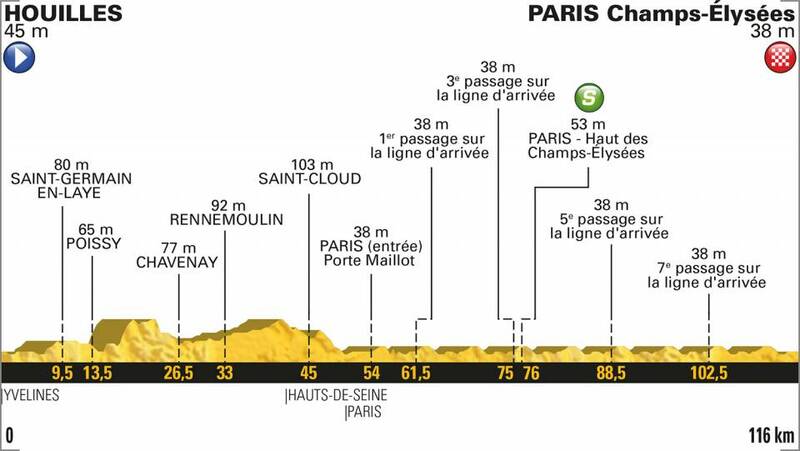 The Tour will once again close with a traditional short stage and an expected final sprint on the Champs-Élysées. A mid-morning start will allow the riders and race fans to reach Houilles in good time, with a finish in the afternoon, and the podium ceremonies in the early evening. This has become the template for the final day in recent years. For the time being, ASO can’t imagine finishing the Tour de France in any other way. Alexander Kristoff (UAE-Team Emirates) got his long-awaited stage win when he outsprinted his rivals to take stage 21 of the Tour de France on cobblestones of the Champs Elysees on Sunday. The big Norwegian blew past John Degenkolb (Trek-Segafredo) and Arnaud Démare (Groupama-FDJ), who rounded out the podium in second and third. Behind, Sky’s Geraint Thomas crossed the line with a comfortable lead on second place Tom Dumoulin (Sunweb) to become the first Welsh winner of the race. A beaming Thomas said it would take a while for his monumental overall title to sink in. “It’s unbelievable. It’s going to take a while to sink in. Normally that stage is really hard but today I just seemed to float around it. I had goosebumps going around there. The support from the Welsh, British flags… it’s unreal. It’s the Tour de France. Kristoff, who has struggled to recapture his dominant sprinting form all race, reflected on finally winning the Tour’s final stage, which is considered the most prestigious sprint finish of the year. “It’s a dream come true. I’ve dreamt about this victory for many years. I’ve been close many times before but never managed to beat the faster guys like Cavendish, Greipel, or Kittel, but today they’re not here, they’re out after the mountains, and today I was the fastest, so I’m super happy. The final stage of the Tour is traditionally a festive affair which sees the riders slow roll towards Paris as the race leader celebrates with his teammates. Thomas took time to soak in the moment as he was set to become the first-ever Welsh yellow jersey winner. The racing began in earnest as soon as the peloton hit the Champs Elysees, with Sylvain Chavanel (Direct Energie) heading off on a solo flyer to celebrate completing his 16th Tour de France. After several laps of racing around the famous boulevard, a breakaway of six riders forged clear. The group included Taylor Phinney (EF Education First-Drapac), Silvan Dillier (AG2R La Mondiale), Guillaume Van Keirsbulck (Wanty-Groupe Gobert), Damien Gaudin (Direct Energie), Nils Politt (Katusha-Alpecin) Michael Schär (BMC), and the presence of several big engines certainly concerned the chasing peloton. The break was never given more than 45-seconds and was duly reeled in with a few kilometers remaining. However, the formulaic run-in was disrupted when Belgian champion Yves Lampaert (Quick Step-Floors) and Bora-Hansgrohe rider Daniel Oss drove off the front with a little over 2 kilometers remaining. Lampaert pushed clear of Oss as the duo passed under the one kilometer to go banner, and briefly looked to have the stunning upset in hand. However, he was caught with only 200 meters remaining when the chasing group opened up their sprints. A hurting Peter Sagan (Bora-Hansgrohe) was left behind as Kristoff unleashed a vicious surge to come off the wheel of Germany’s Degenkolb and France’s Demare. Immediate relief and happiness flashed across Kristoff’s face as he crossed the line to win the biggest sprint finish of the year. Thomas rolled over the line seconds later, smiling and joking with teammate and four-time champion Chris Froome. Geraint Thomas celebrated his victory with his Sky teammates on the ride into Paris for the final stage.